Front Row Seated (L to R): Mike Seidman, Football; Lee Jenkins, Sports Media; Bob Zelinka, Football; Burt Fuller, Volleyball; Jeff Siegel, Horse Racing. Back Row (L to R): Henry & Susan Samueli, Eli Sherman Pillar of Achievement; Nancy Cohen Fredgant, Volleyball; Ramona Shelburne, Master of Ceremonies; Daniel Steres, Soccer; Myra Einberg, Golf; Samantha Shapiro, Gymnastics; Josh Samuels, Water Polo. Not pictured; Bob Gottlieb, Basketball (Deceased); Kevin Pillar, Baseball; Savannah Levin, Soccer; Stan Kasten, Eli Sherman Pillar of Achievement. 2018 SC Jewish Sports Hall of Fame Awards Ceremeony video. Click video in right corner to open new window. The 2018 Southern California Jewish Sports Hall of Fame induction ceremonies took place on Sunday afternoon, June 24 at American Jewish University in West Los Angeles. You are invited to visit the Southern California Jewish Sports Hall of Fame permanent exhibit at American Jewish University. The Southern California Jewish Sports Hall of Fame honors men and women at all levels of sport who have played a significant role in shaping the sports history of the Southern California community. 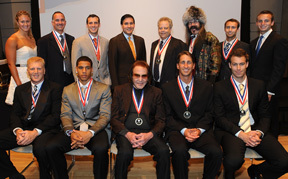 Currently 300 outstanding sport personalities on the Hall of Fame Honor Roll. Their biographies and photographs appear on the Inductees and New Inductees pages. 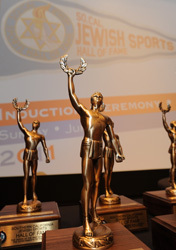 The So Cal Jewish Sports Hall of Fame also provides award recognition to Southern California Jewish male and female High School Athletes of the Year, and presents the Allan Malamud Memorial Award to an outstanding Jewish high school or university student planning a career in print or broadcast journalism. 2016 SC Jewish Sports Hall of Fame Awards Ceremeony video.